For the federal constituency represented in the Dewan Rakyat, see Bukit Mertajam (federal constituency). Bukit Mertajam is a town and the administrative centre of the Central Seberang Perai District in Seberang Perai, Penang, Malaysia. It also serves as the seat of the local government of Seberang Perai - the Seberang Perai Municipal Council. As of 2010[update], Bukit Mertajam contained a total of 13,097 residents. Whilst founded in the 19th century as an agricultural town, Bukit Mertajam also evolved into a transportation hub, following the completion of a railway line towards Perai at the end of the century. To this day, the town's railway station remains a major Malayan Railway station within Seberang Perai. Bukit Mertajam is also well-known for its Catholic congregation, which is centred at the St. Anne's Church. The church is one of the focal locations within Southeast Asia for the annual Novena celebrations. 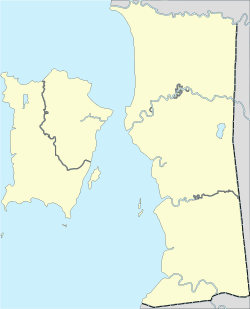 The town of Bukit Mertajam derived its name from the Mertajam Hill, which means pointed hill in Malay. This was said to be a native reference to the geography of the area, where the Mertajam Hill forms the highest outcrop. Bukit Mertajam had been part of the Hindu-Buddhist Bujang Valley civilisation, which ruled over what is now Kedah up to the 6th century AD. A megalith at Cherok Tok Kun, discovered in 1845, contains Pali inscriptions which alluded to the presence of a Hindu-Buddhist polity in the region between the 5th and 6th centuries. The town of Bukit Mertajam only came into existence in the 19th century, after the acquisition of the area by the British East India Company in 1800. Prior to the British acquisition, the area had been inhabited by Malay and Siamese farmers. As the British encouraged the cultivation of spices throughout the newly-acquired territory of Province Wellesley (now Seberang Perai), Chinese settlers, mostly of Hakka origin, moved into Bukit Mertajam. The Chinese migrants opened up spice plantations at the foot of Mertajam Hill and were also involved in granite production. Sugar plantations were established to the south of the town in the mid-19th century. These economic activities led to the construction of roads throughout Province Wellesley. With many of these roads converging in Bukit Mertajam, the town soon became a transit point for the movement of agricultural produce towards the Port of Penang. Bukit Mertajam's role as a transportation hub was cemented with the completion of a railway line between Bukit Mertajam and the coastal port town of Perai in 1899, allowing for a rapid transportation of commodities such as rubber and tin towards the harbour. Concurrently, public amenities, such as schools, a magistrate's court and a hospital, were built, and by the turn of the century, Bukit Mertajam was selected by the Straits Settlements authorities as the administrative centre of the Central Province Wellesley District. The Bukit Mertajam Town Council was established in 1953. At the time, it was one of the five local governments within Province Wellesley. The local governments were eventually amalgamated and transformed into the present-day Seberang Perai Municipal Council by 1976. 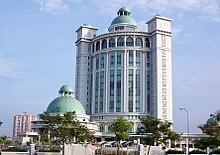 In 2006, the headquarters of the municipal council was relocated from Butterworth to the Bandar Perda township near Bukit Mertajam, making the latter the seat of the local government of Seberang Perai as well. Beginning in the 1970s, residential estates were also developed in the areas surrounding Bukit Mertajam, fuelled by the industrialisation of certain areas near the town, such as Bukit Minyak and Bukit Tengah. The town of Bukit Mertajam is situated close to Mertajam Hill, which is surrounded by flat alluvial plains. Bukit Mertajam neighbours Permatang Pauh to the north, Mengkuang Titi to the east, Alma and Permatang Tinggi to the south, and the industrial estate of Bukit Tengah to the west. The Bandar Perda township houses the administrative centre of the local government of Seberang Perai, the mainland half of the State of Penang. The MPSP building, completed in 2006, is the headquarters of the Seberang Perai Municipal Council. In addition, the District and Land Office of the Central Seberang Perai District is situated at Jalan Betek. As the seat of the district, Bukit Mertajam contains the district's Magistrates Court as well. According to the 2010 Census conducted by Malaysia's Department of Statistics, Bukit Mertajam had a population of 13,097. Nearly ​3⁄4 of Bukit Mertajam's population consisted of ethnic Chinese, followed by the Malays at 13% and the Indians at 9%. The main thoroughfares within Bukit Mertajam include Jalan Pasar and Jalan Kulim. In addition, both the North–South Expressway and Federal Route 1 pass by Bukit Mertajam, linking the town with the rest of Peninsular Malaysia. Similar in function to the aforementioned pan-Peninsular expressway, the Bukit Mertajam railway station provides intercity rail transportation towards other major cities and towns along western Peninsular Malaysia, as well as on to Woodlands in Singapore. Rapid Penang's routes 606, 701, 702, 707, 709 and 802 serve the residents of Bukit Mertajam, connecting the town with other parts of Seberang Perai, such as Butterworth, Perai, Juru, Simpang Ampat and Nibong Tebal. These routes are complemented by Rapid Penang's Congestion Alleviation Transport (CAT), a free-of-charge transit service within Bukit Mertajam. Cityliner also operates an additional bus route between Bukit Mertajam and Butterworth. Bukit Mertajam contains a total of 14 primary schools and seven high schools. In addition to these schools, the Penang State Library also operates a branch in Bukit Mertajam. The Bukit Mertajam Hospital, run by Malaysia's Ministry of Health, is one of the six public hospitals scattered throughout the State of Penang. Completed in 1890, it is currently a non-specialist hospital with a capacity of 242 beds. It offers a limited range of treatments, including gynaecology, paediatrics and psychiatry. Bukit Mertajam also contains a private hospital, namely the KPJ Penang Specialist Hospital. The 236-bed hospital, owned by Johor Corporation, offers various specialist treatments, such as gastroenterology, physiotherapy, lithotripsy and haemodialysis. The Summit Bukit Mertajam Plaza is the sole shopping mall within Bukit Mertajam proper. Launched in 1997 and situated at Jalan Arumugam Pillai, it consists of a four-storey retail block and a high-rise currently occupied by The Summit Hotel. St. Anne's Church is the focal point of the annual Novena festivities within Southeast Asia. Built in 1888, St. Anne's Church is one of the most recognisable landmarks in Bukit Mertajam. It is one of the parishes of the Roman Catholic Diocese of Penang. Every year, the church hosts one of the largest Novena festivals in Southeast Asia, attracting about 100,000 visitors. The town centre has a number of tourist destinations, including the Bukit Mertajam Market and the nearby Hock Teik Cheng Shin Temple. The latter is a Taoist temple, which was constructed in 1886. At the time, the temple owned much of the land within the town centre and was responsible for the development of the Bukit Mertajam Market. The two-storey market, built in the late 19th century, was last renovated in 1934 by the British authorities. ^ a b "Key Summary Statistics For Local Authority Areas, Malaysia 2010" (PDF). Department of Statistics, Malaysia. Archived from the original (PDF) on 5 February 2015. Retrieved 19 April 2012. ^ a b c d e f Lees, Lynn Hollen (2017). Planting Empire, Cultivating Subjects. Cambridge: Cambridge University Press. ISBN 9781107038400. ^ a b c d e f g "The history of Bukit Mertajam Part I – From agrarian village to economic hub". The history of Bukit Mertajam Part I – From agrarian village to economic hub. Retrieved 2018-03-25. ^ User, Super. "BM 03. Tides of candlelight adoration at St. Anne's Feast". butterworthguide.com.my. Retrieved 2018-03-25. ^ a b "St Anne's Festival". St Anne’s Festival. Retrieved 2018-03-25. ^ a b c d "Rising from foothold in spice trade - Metro News | The Star Online". thestar.com.my. Retrieved 2018-03-25. ^ Tham, Seong Chee (1990). A Study of the Evolution of the Malay Language: Social Change and Cognitive Development. Singapore: National University of Singapore. ISBN 9789971691363. ^ Habibu, Sira. "Lembah Bujang covers a larger area - Nation | The Star Online". Retrieved 2017-05-01. ^ a b "The history of Bukit Mertajam, Part II:From rural board to town council". The history of Bukit Mertajam, Part II:From rural board to town council. Retrieved 2018-03-25. ^ a b Goh, Ban Lee (June 2010). "Butterworth remains the Ugly Duckling". Penang Monthly. ^ "Bukit Mertajam hub of the north - Business News | The Star Online". thestar.com.my. Retrieved 2018-03-25. ^ Joshua Woo (September 2016). "The Mainland Awakens". Penang Monthly. ^ Abd. Rahman, Abdul Hadi (2000). "Coastal Sedimentation and Recent Coastline Changes Along the Seberang Perai Coast, Pulau Pinang". Universiti Malaya. ^ "Executive Summary Draft District Local Plan: Central Seberang Perai 2006 - 2020" (PDF). Seberang Perai Municipal Council. ^ "Give Butterworth a coastal park". Give Butterworth a coastal park. Retrieved 2018-03-25. ^ "spt.penang.gov.my". spt.penang.gov.my. Retrieved 2018-03-25. ^ "Court Directory - Penang Bar Committee". Penang Bar Committee. Retrieved 2018-02-03. ^ "Buletin Mutiara". facebook.com. Retrieved 2018-04-01. ^ "Cityliner". cityliner.com.my. Retrieved 2018-03-18. ^ "SK CONVENT - PULAU PINANG - Carian Sekolah Malaysia". sekolahmy.com (in Malay). Retrieved 2018-03-25. ^ "SK BANDAR BARU PERDA - PULAU PINANG - Carian Sekolah Malaysia". sekolahmy.com (in Malay). Retrieved 2018-03-25. ^ "SK STOWELL - PULAU PINANG - Carian Sekolah Malaysia". sekolahmy.com (in Malay). Retrieved 2018-03-25. ^ "SK KG BARU - PULAU PINANG - Carian Sekolah Malaysia". sekolahmy.com (in Malay). Retrieved 2018-03-25. ^ "SK KEBUN SIREH - PULAU PINANG - Carian Sekolah Malaysia". sekolahmy.com (in Malay). Retrieved 2018-03-25. ^ "SK JUARA - PULAU PINANG - Carian Sekolah Malaysia". sekolahmy.com (in Malay). Retrieved 2018-03-25. ^ "SK SUNGAI RAMBAI - PULAU PINANG - Carian Sekolah Malaysia". sekolahmy.com (in Malay). Retrieved 2018-03-25. ^ "SJK(C) JIT SIN 'A' - PULAU PINANG - Carian Sekolah Malaysia". sekolahmy.com (in Malay). Retrieved 2018-03-25. ^ "SJK(C) JIT SIN 'B' - PULAU PINANG - Carian Sekolah Malaysia". sekolahmy.com (in Malay). Retrieved 2018-03-25. ^ "SJK(C) KEOW KUANG - PULAU PINANG - Carian Sekolah Malaysia". sekolahmy.com (in Malay). Retrieved 2018-03-25. ^ "SJK(C) KIM SEN - PULAU PINANG - Carian Sekolah Malaysia". sekolahmy.com (in Malay). Retrieved 2018-03-25. ^ "SJK(C) PERKAMPUNGAN BERAPIT - PULAU PINANG - Carian Sekolah Malaysia". sekolahmy.com (in Malay). Retrieved 2018-03-25. ^ "威中明德正校 SJKC BENG TEIK (PUSAT)". bengteik.sjkc.com.my. Retrieved 2018-03-25. ^ Zabidi, Nor Diana. "Portal Rasmi Kerajaan Negeri Pulau Pinang - Majlis Penyampaian Cek Bantuan Kewangan Kepada Sekolah-Sekolah Tamil Negeri Pulau Pinang Tahun 2015". penang.gov.my. Retrieved 2018-03-25. ^ "SMK CONVENT (M) BUKIT MERTAJAM - PULAU PINANG - Carian Sekolah Malaysia". sekolahmy.com (in Malay). Retrieved 2018-03-25. ^ "SMK BANDAR BARU PERDA - PULAU PINANG - Carian Sekolah Malaysia". sekolahmy.com (in Malay). Retrieved 2018-03-25. ^ "SMK BERAPIT - PULAU PINANG - Carian Sekolah Malaysia". sekolahmy.com (in Malay). Retrieved 2018-03-25. ^ "SMK PERMATANG RAWA - PULAU PINANG - Carian Sekolah Malaysia". sekolahmy.com (in Malay). Retrieved 2018-03-25. ^ Izzad. "BRANCH LIBRARIES". penanglib.gov.my. Retrieved 2018-03-25. ^ a b c "Penang Seberang Perai Government Hospitals". Penang Trails. 2016-03-15. Retrieved 2018-03-22. ^ "Official Portal for Ministry of Health MalaysiaList of Government Hospitals". moh.gov.my. Retrieved 2018-03-25. ^ "KPJ Penang Specialist Hospital". Penang Trails. 2016-03-16. Retrieved 2018-03-25. ^ "The Summit Bukit Mertajam". Time Out Penang. Retrieved 2018-03-25. ^ "Mall lauded for holding events for the benefit of community - Community | The Star Online". thestar.com.my. Retrieved 2018-03-25. ^ "More than 100,000 pilgrims celebrate the feast of St Anne at Bukit Mertajam". thesundaily.my. Retrieved 2018-03-25. ^ "Bukit Mertajam Market". Penang Trails. 2016-11-02. Retrieved 2018-03-25. Wikimedia Commons has media related to Bukit Mertajam. This page was last edited on 9 January 2019, at 18:12 (UTC).